Any Snobs in the Macarthur area of Sydney? I'm thinking of having a get together in a couple of months. 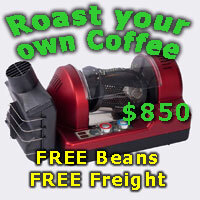 Just to chew the fat, have a play with different coffee makers (manual, pour-over, etc), portable roasters, etc. Try some different roasts anyone would like to bring. I might even do pulled pork, smoked ribs etc for a feed. I had a get together early 2010, which was a good afternoon with some local Snobs. What are the general thoughts? I'd be interested. Last time I was at a get together was organised by John Hancock at his work place in the inner city. It was ages ago. It was a nice get together. I'll see how many might be interested and start making plans from there.